Geum Jan Di, an average girl which her family run a laundry shop. The drama begin when she manages to get a swimming scholarship to enter Shinhwa High School. Shinhwa High School is own by Shinhwa family. 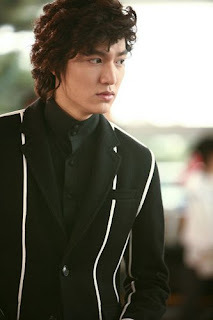 Gu Jun Pyo is a son of Shinhwa and member of F4 (Flower 4) with three another boys (Yoo Ji ho, Yi Jeong and Woo Bin). F4 is very popular and everybody especially girls seems to adore them. F4 love to bully everyone who not doing what they ask and Jan Di is one of the victim. But, Jan Di is so brave when she manages to fight Jun Pyo and its makes Jun Pyo to falling in love to her. This drama is about Jan Di's and Jun Pyo's love that had to face many obstacle that creates by Jun Pyo's mother and about friendship that shown by Ji Ho, Yi Jeong and Woo Bin. The synopsis above is about Boys Over Flowers. This korean drama series is one of my favourite. Even I already know the story line and have actually watched the Japanese version(Hana Yori Dango) of this Boys Over Flowers but still love to watch this korean version. My friend(Linda) and me share the same view that this korean version is much more better than Japan or Taiwan version(one of the reason is the boys..so gorgeous!!). TV Series : Boys Over Flowers, Strongest Chil Woo, The King and I, Pure 19, Ballad of Suh Dong, Drama City and Nonstop. Trivia : MC of Inkigayo Music Program, Host of SBS Drama Award and singer of Pure 19 theme song(she is the singer). Movies : Our School E.T, Public Enemy Return, Humming, Arang, Ghost Lives and Repechage. Hobbies : Dancing, Playing guitar and piano. Recognition : The 45th Baeksang Arts Awards-popularity Award(Male).